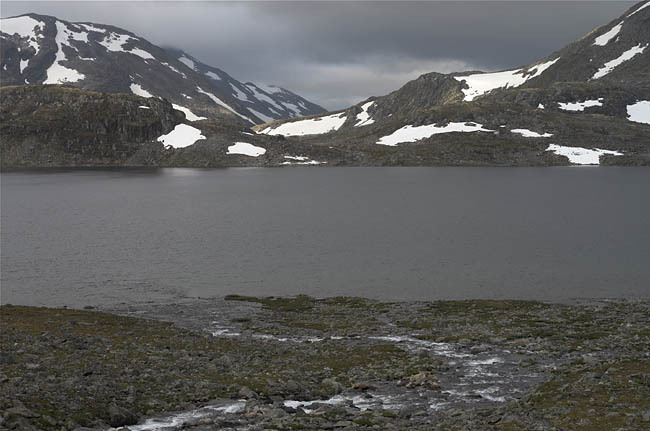 A small spot on a small lake high above Storådalen served as campground on our way to Memurubu. 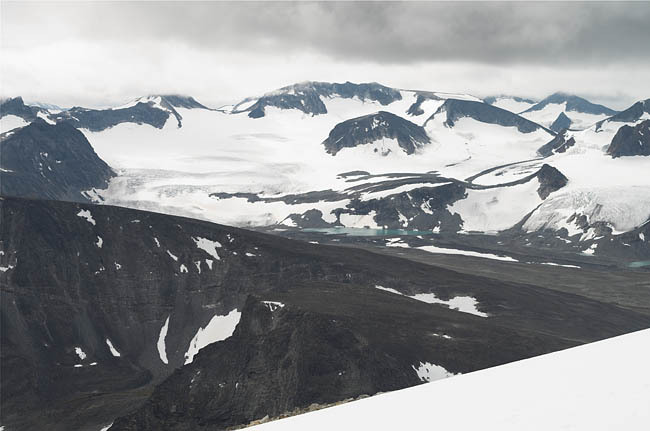 We had started our tour in Eidsbugarden, passed through Veslådalen and Gjendebu, then climbed up to this point. 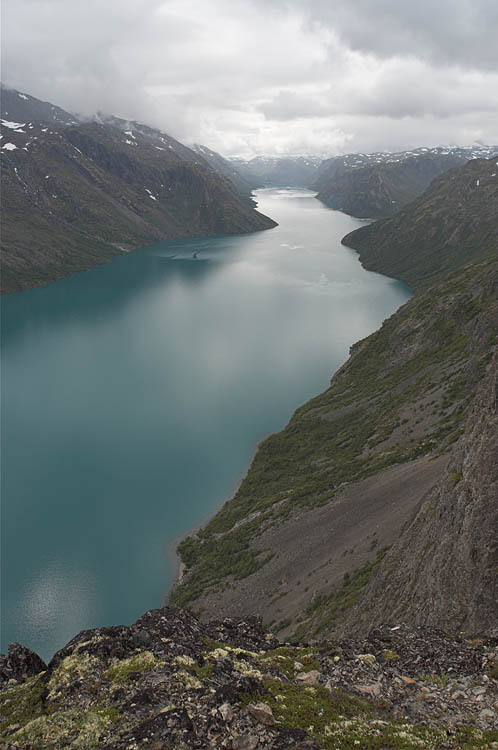 The view goes across the Gjende, not visible down in the abyss, at a place called Knutsholet. 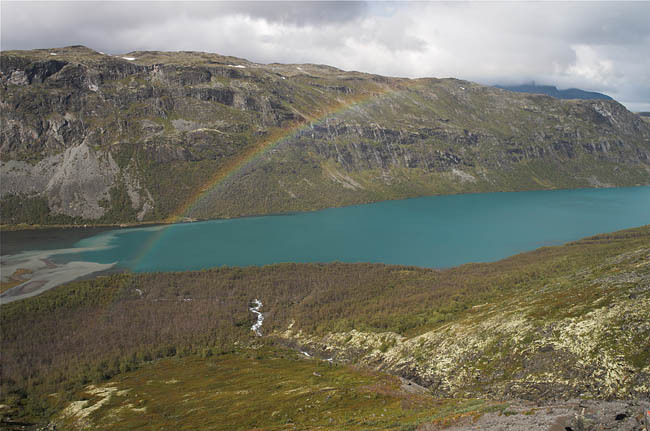 The map does not name the lake in the foreground, but lists an elevation of 1420 m.
Before descending into Memurubu, the trail offers a tremendous view of Gjende. A rare period of fair weather gives us a chance to see the lake wearing its characteristic blue color. 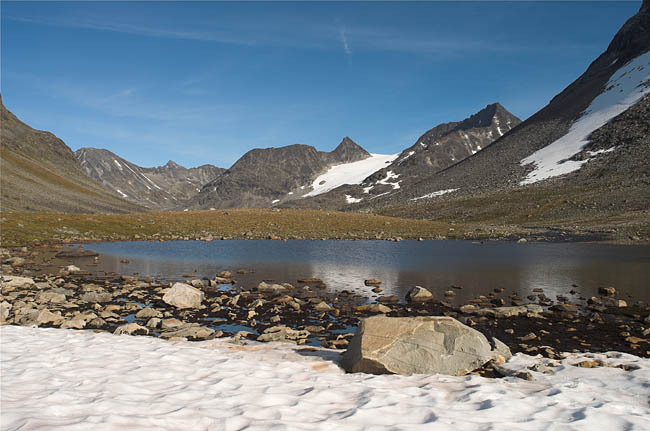 After having spent the night in Memurudalen not far from the hut we are now already close to Besseggen. 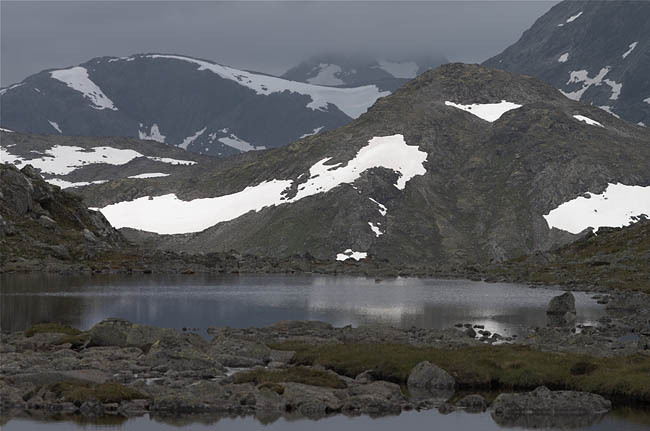 The mountain Knutshøe marks the left side of the broad Leirungsdalen on the opposite shore of Gjende. Standing high over Bandet, I have a good look down the lake to its western end. We stayed close to Bandet for this night, on a small streamlet flowing into Bessvatnet. 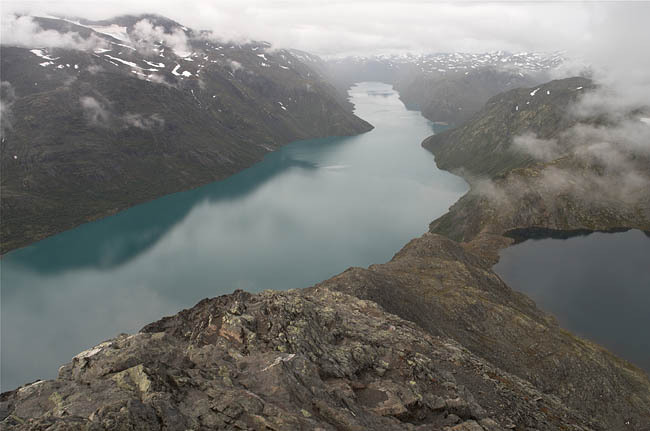 From the same point, but looking to the other side, to the Besseggen and Bandet, 400 m over Gjende. 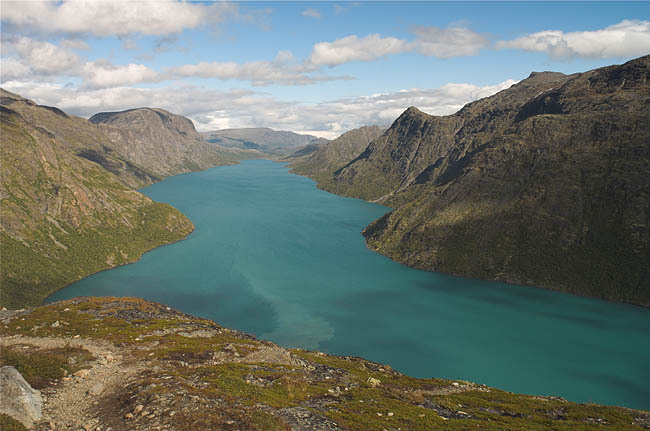 The smaller lake trapped 400 m above Gjende is called Bessvatnet. Its water doesn't come from glaciers, hence it is absolutely clean and not of a breathtaking blue when seen from afar. 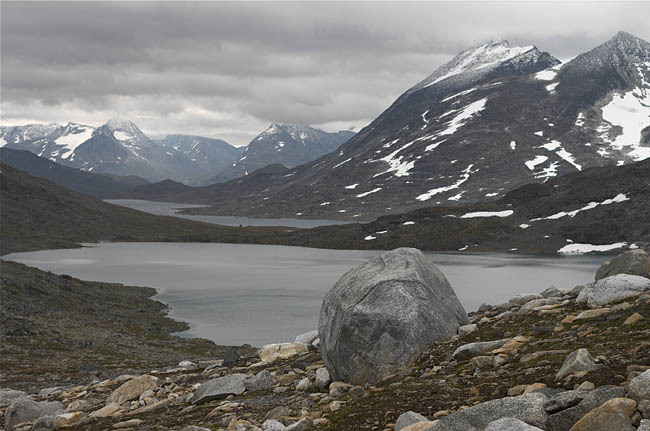 The famous classical view at Besseggen, although the weather could have been nicer. At least there is some visibility left on this rainy day. 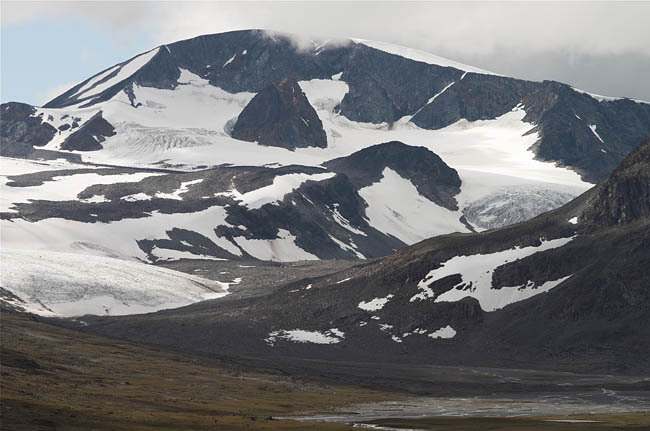 A panoramic view with the red-painted Memurubu-hut on the left-hand corner. The trail leads over the ridge in the center, from where it drops steep in the most uncomfortable manner down to the hut. While crossing a pass on our way in the direction to Glitterheim we catch the full sight of Glittertinden. In the foreground a typical trail mark, the red "T". 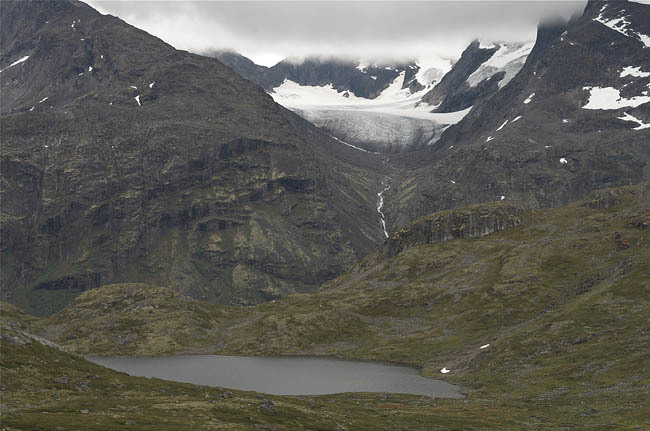 The Veobrean, a handsome glacier at the end of Veodalen and the source of the river Veo. A glimpse of the valley Veodalen right after the bridge across Veo and a couple of hundred meters before Glitterheim. 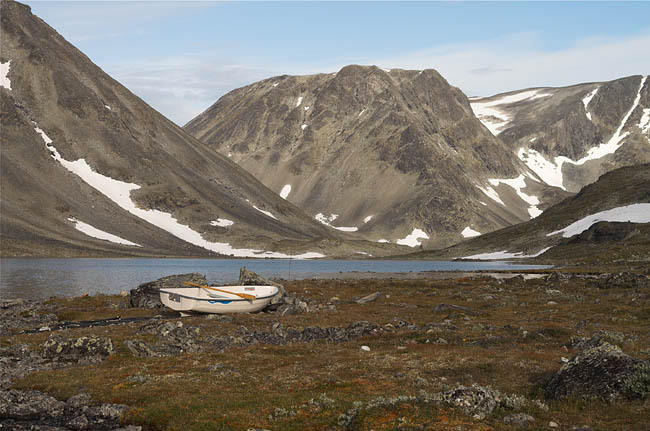 We passed the hut and climbed another hundred meters up to camp on the lake Steinbuvatnet, directly underneath the Glittertinden. 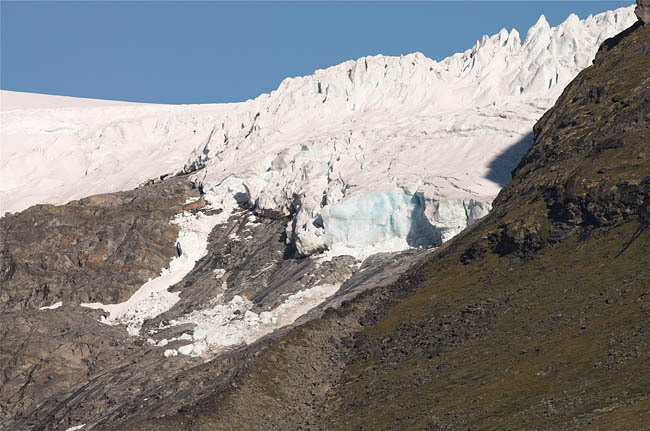 During the long ascent on Glittertinden we caught these arctic impressions - the relatively big glacier Veobrean seen from another glacier, the Glitterbrean. Then, in order to intensify this impression, it started to snow. 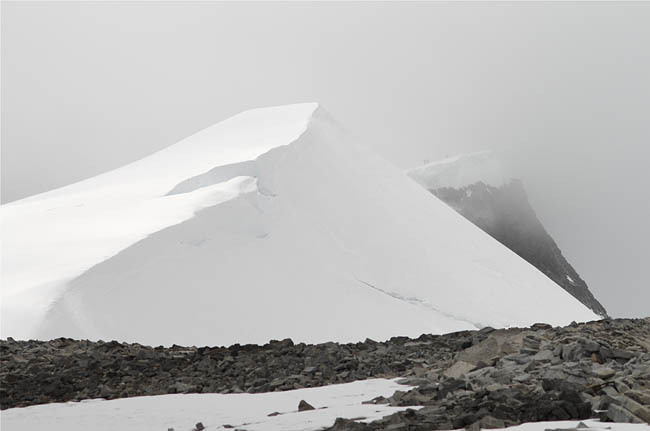 The summit of Glittertinden (2465 m) behind a mighty heap of snow. 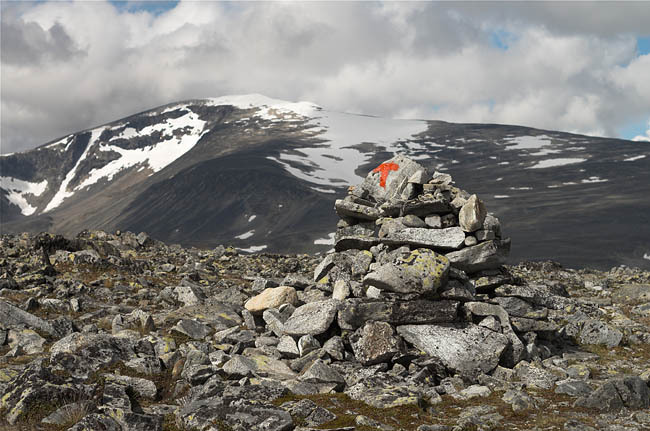 For a long time Glittertinden served on duty as the highest mountain of Norway, but got decommissioned in favor of its neighbor Galdhøpiggen (2469 m) for having cheated with its thick snow layer. 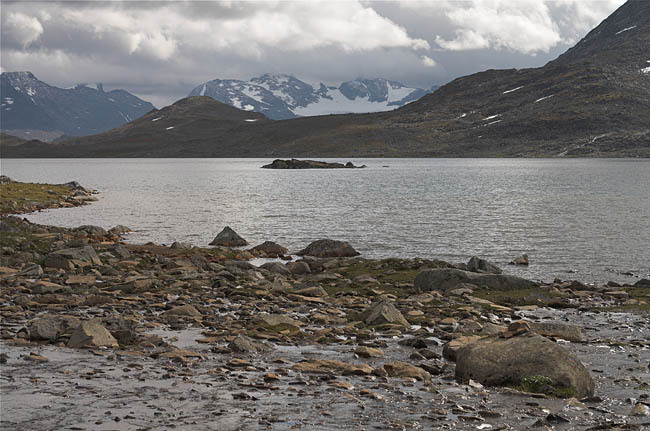 Summer or not, in Jotunheimen you have to embrace yourself against cold. 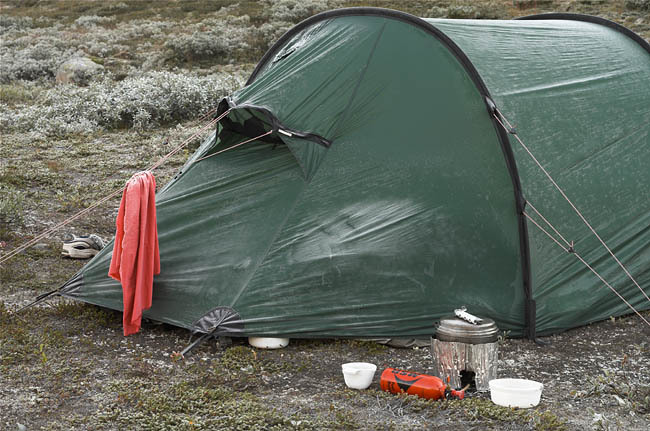 After a cold night our frozen tent soon got heated up by the sun; a rare day with a blue sky was to follow. To refrain from staying in the comfortable huts means carrying a good weight of food for almost two weeks plus equipment. 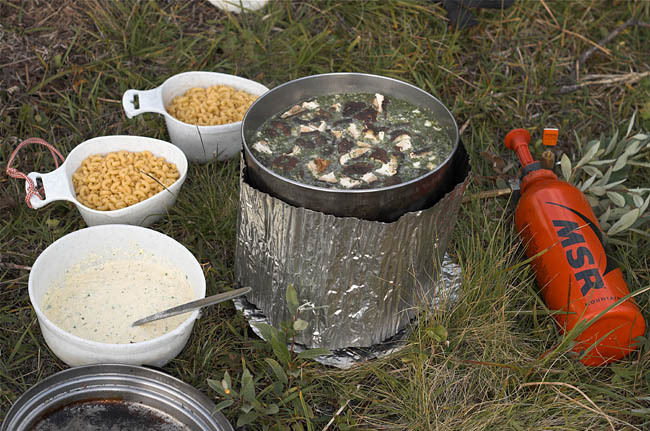 The mushrooms, however, were served by the surrounding meadow. 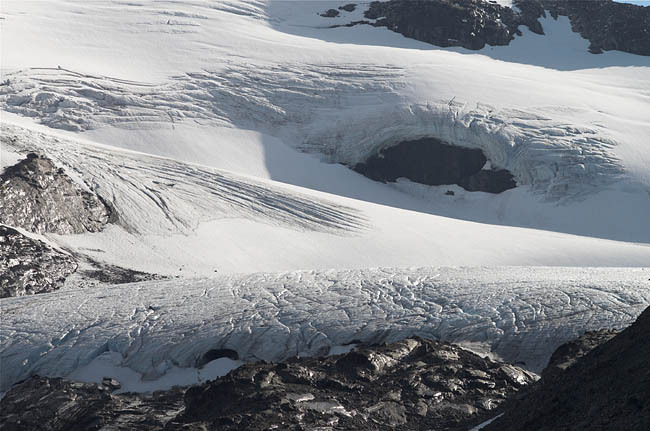 It certainly looks as if it isn't a good idea to stand underneath this glacier. In spite of possible icefall a trail leads to the Svellnosbrean according to our map. Luck has always been the best companion of hikers. 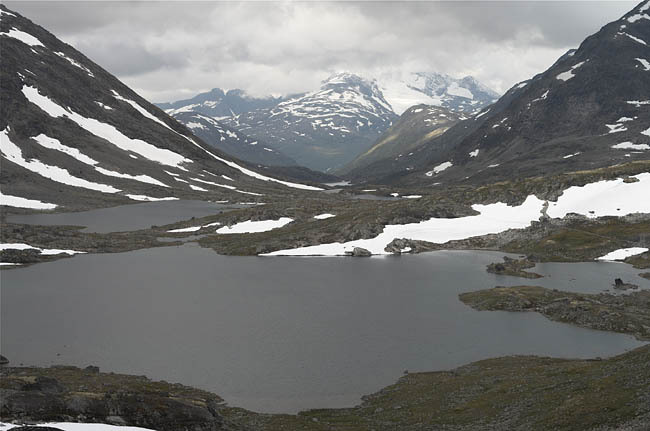 The Jotunheimen hosts numerous glaciers, although it lacks the big ones. 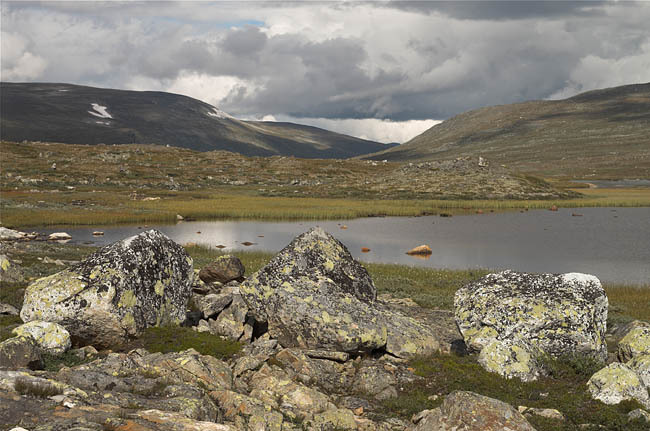 This one lives on the northeast slopes of Svartdalen, a junction between lakes Gjende and Bygdin. And on we went up the Visdalen under a deep blue sky, got over the highest point and reached some small lakes already in the vicinity of Leirvassbu. 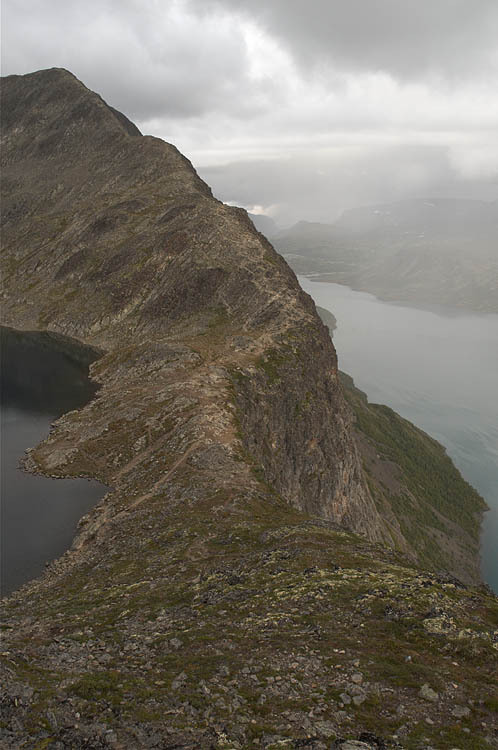 This photograph shows the view back in the direction of Spiterstulen. 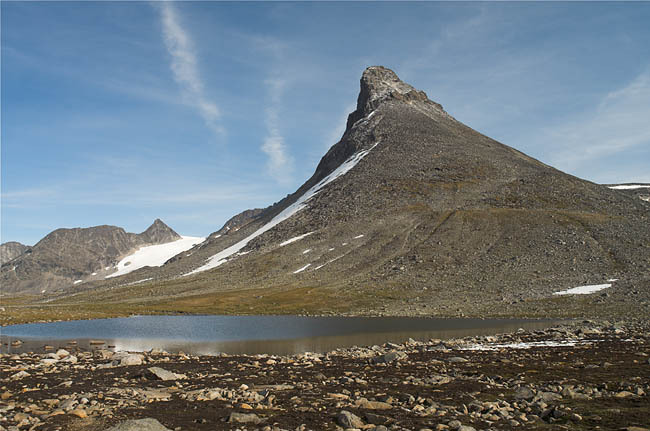 It's almost the same view as on the left, but a few degrees more to the right, which brings an unusual mountain in sight with the name "Kyrkja", Church in Norwegian. From this angle of view, however, it looks more like a dwarf's cap. A look from our camp near Leirvassbu at the Leirvatnet after a healthy rainstorm, which got us nailed to this place for a whole day. We knew this was coming. Whenever there is a blue sky above, the future is already ruined by the weather report hanging in the hut you come from. From above the Leirvatnet we look into Gravdalen, a valley leading almost to the west. A small dirt road goes on for a few kilometers to a dam, but it isn't our way to go. We head on into this new valley and again to Gjendebu. 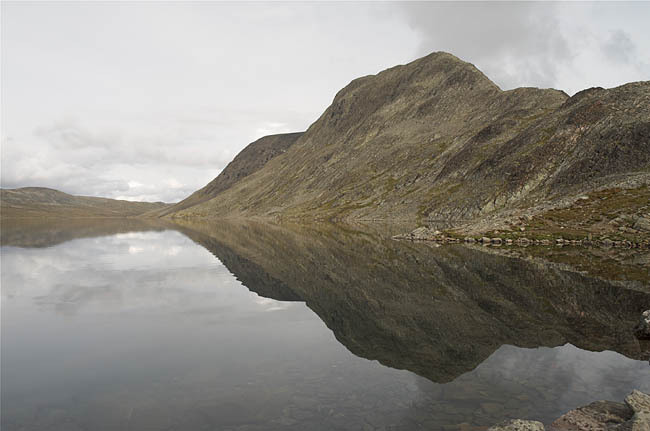 The first lake is called Øvre Høgvagltjønnen, whereas the farther one must be Longvatnet. No blue sky, but also no rain. All in all it takes four lakes for the river Storåe to reach Gjende. 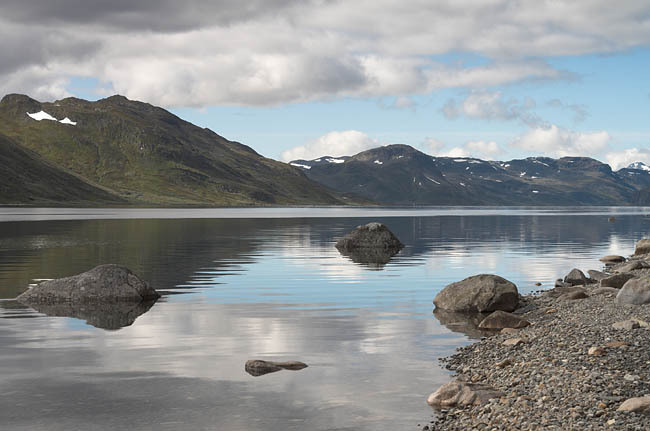 Langvatnet is, by its name, a long lake and the biggest of the quartet, but it is by far not the longest lake in the area. 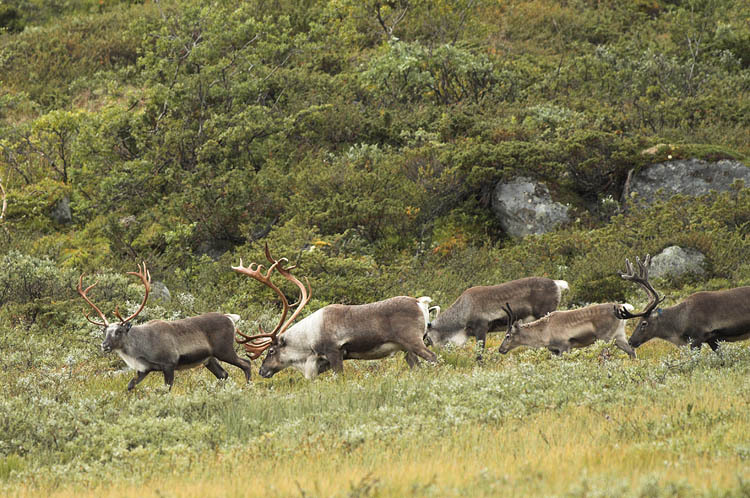 ...and some reindeer herds. 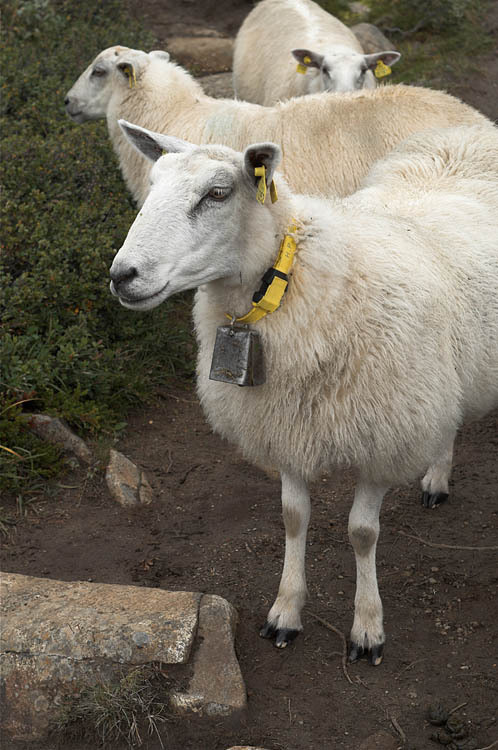 The earmarks clearly show the economical background of these creatures, not to mention the bells. 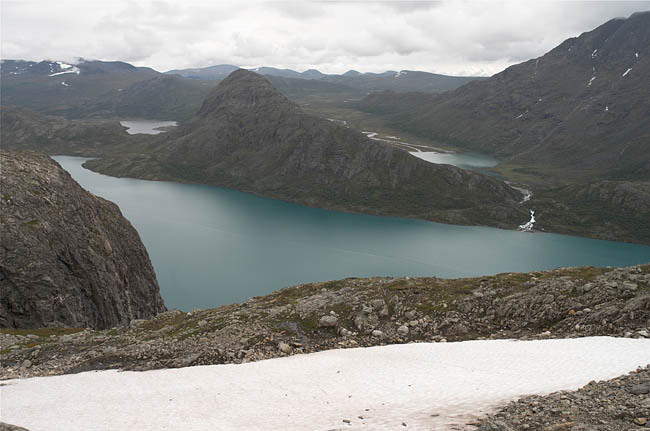 After passing Gjendebu and waiving on the ship to Gjendesheim we took the very steep ascend up into the Svartdalen to Torfinnsbu, a comparatively small hut on the Bygdin. The weather was still after us, as the rainbow shows. Almost two weeks ago we started from the western end of this lake. Now, having arrived in the middle of it, all it takes is to walk to its eastern end to reach the road and a bus ride to Oslo.